I have a first for you today, readers. Input from a special guest....*drum roll*...my sissy, Britney! She is in town from Ohio and I may or may not have forced her to come to one of my favorite theater venues, the amphitheater at Murray Park, with me to see, "The Scarlet Pimpernel." I had three friends whom I had promised I would attend and the only time I could go is if she came with me, so what had to be done had to be done. Our hero charades as a frou-frou socialite and has all of his band of men, the bounders, follow suit. He is married to a former spy who has changed her ways and does not know of his heroic endeavors. The villain tries to stop the revolt of the league of the Pimpernel against those enforcing the laws with the guillotine. More or less. Last year, my favorite community production was Hale Orem's version of Pimpernel, so I was a bit skeptical going into this one. Ends up, without reason. But most of you know my concern when I say that, in Utah community theater, a lot of men end up being begged to do a show, whether talented or not-so-much. And there are a lot of men in this show. I've always found the first twenty or so minutes of the show to be kind of...blah. When the entire cast came out on stage to sing, "Madame Guillotine," I found the blah quite gone and leaned over to my sister and said, "Wow. That was intense." "Into the Fire" continued to wow me - all the men were mic'd and some empty part of my soul is filled every time my ears are filled with the refrains of melodic men. I didn't see a weak link among them. As Marguerite St. Just, Rebekah Law steals your heart with her beauty and rich mezzo-soprano sound. She suffered a little in the higher registers and I couldn't help but get the impression she may be recovering from some sort of illness, as her speaking voice became a little scratchy. During the emotional moments, she left nothing wanting. Percy, as performed by Cameron Boyle, found the fine balance in the intricacies between fop and fearless hero. I won't say much on him because he was my sis's favorite part. Our villain, Chauvelin, aka Jacob Shamy, well, let's just say he would definitely frighten the young children. I don't know if I can fairly comment because he is actually a comrade of mine, but, even as his friend, he definitely exceeded my expectations. The funny man, in my opinion, cannot succeed as well without his straight man, at which this villain excelled. And his booming singing voice soared through the rafters, filling the amphitheater and onto the night sky. The set was simple, but I can say I was impressed with the boat that folded up in the area under the orchestra that could be pulled out and actually looked a real boat within seconds. Especially when that boat filled with men dressing up in disguises, some as wenches. The sound? Well, there were the normal cracklings, but I found that the cuts and static happened far less than in most other shows I've seen in the community. I actually saw a show just last week that the sound difficulties were making my blood boil and detracted from the show 1,000%, so this was a nice step up. And can I just say how much I LOOOOVE a live Orchestra - thank you, Murray, I love this touch! The guillotine use also impressed me - nothing like heads rolling to impress an audience...that sounds awkward. All in all, I enjoyed some aspects of this show more than last year's, some less, but I was not disappointed at all. If you like "Pimpernel," then you should definitely go see this production. The venue is so beautiful and charming, the cast are all strong and delightful. I could not wait to run up to my friends and give them huge hugs after their bows. Nancy, Ann, Shamy - shout out's to you! THANK YOU for the splendid night of theater. "The amphitheater is amazing! Beautiful - I loved it. I wouldn't have guessed! It looks like a venue where you would have a professional concert. I thought the main girl was gorgeous and beautiful but her and her story line just didn't do it for me. Chauvelin was really creepy, he did a great job at being a villain and definitely made me not like him. He pulled the creeper look off very well - if you don't look creepy and are mean, it just isn't as fun. I really enjoyed Percy and Chauvelin's interactions together - they played off each other really well. Especially when Percy kept calling him 'Shuvlin.' Oh my gosh, you know what part I really loved? When Percy was trying to spell Chauvelin's name and Chauvelin kept getting so mad and Percy just kept right on at it. If this were a movie, I would have pressed rewind to watch it over and over again. There was one older gentleman in the group, whose dress looked like Easter or a clown or something, who always confused me because he just looked lost and I couldn't figure out if that was his character or not. All the men looked like Easter eggs. One of the men stumbled on his lines a bit when he was in the bushes with Chauvelin, but he covered so well that I actually enjoyed this because it shows these actors are real people and demonstrates some of the charm of live theater. No offense to my sister, but it was a lot better than the last show I saw her in (Gee, thanks, Brit). I've not seen a lot of community theater, so I didn't know how to judge this fairly. My sister and I go to New York every year to see professional Broadway shows. I actually wouldn't have minded seeing it again, so I'd give it probably give it a 7 on a scale of 1-10, but you have to cut out the first twenty minutes. Saying I'd sit through it again says a lot...especially when you factor in that I was FORCED to be there and not happy about it." And that's about it, folks. You can still catch the show at 8pm at the Amphitheater in Murray Park until Thursday night, June 30th. 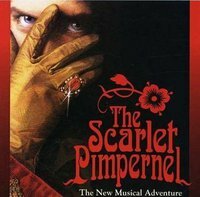 I was trying to look up Murray's Scarlet Pimpernel and look what I found! That's a great review, I'm going excited to see it tonight, thanks Larissa.